How Well Do You Know The World's Best Bridges Quiz! This past week, after nine arduous years of construction and with a flabbergasting $18.7 billion splurged on the project, China finally opened Hong Kong-Zuhai-Macao Bridge, linking the three major cities on the Pearl River Delta. The world's longest sea crossing, China's latest engineering marvel stretches a colossal 55km, featuring three cable-stayed bridges and four artificial islands. It took 400,000 tonnes of steel to construct - enough to erect 60 Eiffel Towers. It's all a bit much, really. Yet on the day of its grand opening, the roads were basically empty. It could be down to the fact that the Chinese government only made 10,000 permits to cross the bridge available. But it might just as easily be due to the fact that, for all its record-busting figures, the behemoth bridge is just a massive slab of concrete in the sea. Where's the fun in that? All around the world, a whole host of brilliant, more beautiful bridges exceed their original remit of transporting people from one bank to the other, standing proudly as architectural attractions in their own right, cultural landmarks fit for postcards. The HZMB isn't one of them - but how well do you know these other world famous crossings? Try to enter the Bridge Club with our perilous pontiff posers. 1. 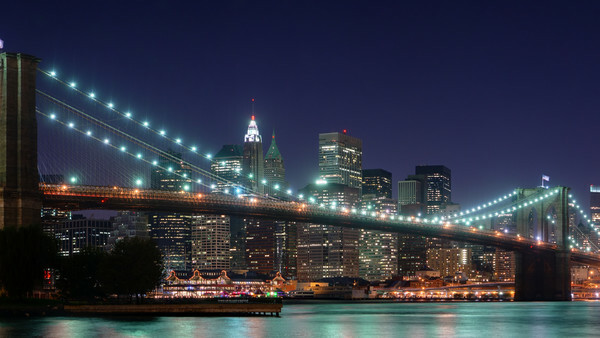 Which Famous New York Landmark Used To Be Known As The East River Bridge?